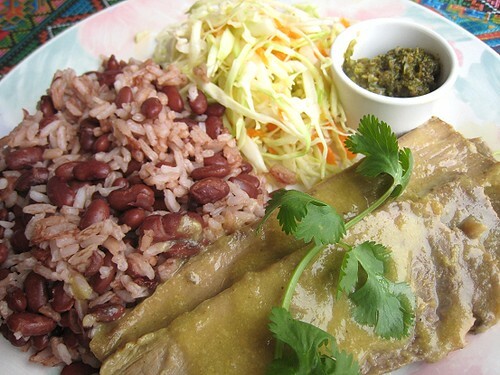 If anybody has more information on Latin American foods, please feel free to share. This is another one of those "difficult" Saturday lunches. We debated where to go and ended up here at Chicas because it was close. Plus, it seemed to offer interesting food. Formerly, the space was occupied by a supposed Mexican restaurant. We tried those supposed tacos a couple of years ago -- and, well, suffice it to say that I've had better tacos coming from an El Paso boxed kit. So, we were actually quite glad to see a new place has opened up. We went in and there were only a couple of tables seated. I did not find that at all surprising, considering the location of this place. The owner, or the lady who seemed to be owner, was busy making rice and beans, and the smell permeated the place. It was a comforting smell. 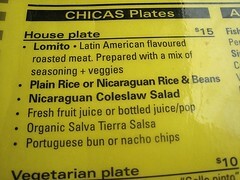 Looking at the menu, we were once again confronted by our lack of knowledge regarding Latin American foods. 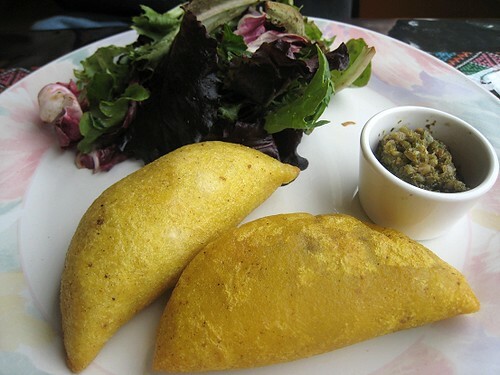 For example, different kinds of empanadas! We were whispering among ourselves: "What's Colombian style? What's Venezuelan style?" 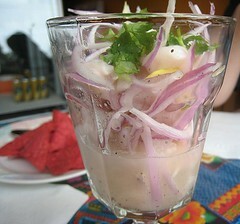 I believe the menu noted that this was a Peruvian ceviche? But I don't recall now. 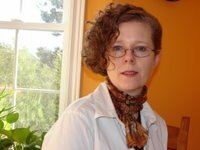 I learned a little bit about the different kinds of ceviche (after the fact) from Laylita's site. Whatever kind it was, it was delicious! 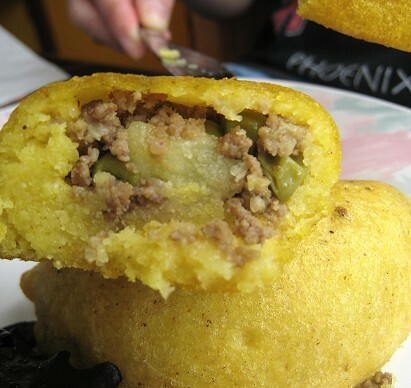 This was the first time I've seen empanadas encased in a corn dough! Of course, with me and my cornmeal-love, I definitely liked that. The meal here was definitely satisfying. Will return. We leave you with this conversation we had after our meal. We entered the store beside Chicas where there were a couple of guys eating sandwiches. Upon noticing that we came from Chicas, one guy asked us about it. guy: "How was it? Good?" ts: "Yeah, it was good." guy: "It's Mexican food, right?" ts: "Oh, no. That was the place before. Now they don't have tacos or burritos or anything like that. It says Latin American food." guy: "Yeah, but it's based on Mexican food, right?" ts: "They have Peruvian food, Colombian, Venezuelan... [slight pause] oh, and Nicaraguan food." guy: "But they're all based on Mexican food, right?" I saw TS wanting to reply again to his comment, so I just ended this conversation by saying loudly, "Yeah, sure." There really was no point in pursuing the conversation further, given that the guy didn't even know his continents and countries. Wow - that food really did look great! 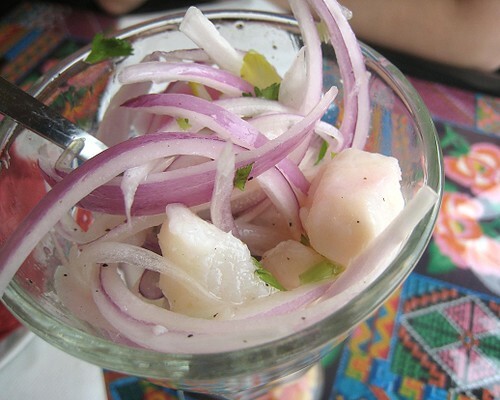 I love Peruvian-style ceviche the best. And I've been known to want to drink the juice too. I've never tried Colombian or Venezuelan food, so curious to try. It's all based on Mexican food right? Haha. OK, I'll stop. 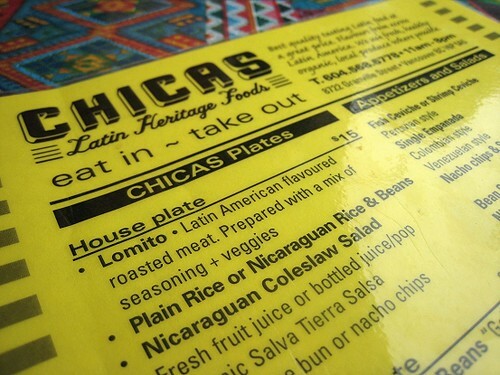 Chicas is now on my list of places if/when/maybe/probably get to Vancouver. Thaaaanks. Teehee. JS decided to save me aggravation by cutting in like that. Hmm, it's been so long. I think we should go and see how it is now. last weekend my hubby stop at one famous Spanish-south american restaurant in Harlem to taipau some food.he ask me to take a bite but I don't dare cos the cornmeal wrapped wt beef.Sorry don't eat beef.he said the food is the best in upper west side(harlem)believe it's or not this south american ppls are really complicated! Actually NYC have alot of good and cheap south american restaurant!it's funny ts conversation.I have the same experience with their language! I thought all of them are same but not! The worst is there are 2 different meaning on the same word.A drink name and a name of body part,woman body part!lol! I am quite sure I coupdn't pick up a Peruvian style ceviche in a police line-up - but have loved every Mexican style ceviche I've had! 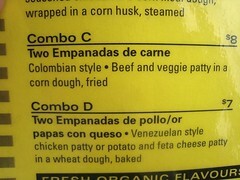 Those cornmeal empanadas sound wonderful too.